Do you disagree with something I have to say on this site? I’d love to hear about it, please leave a comment under the particular post you disagree with. 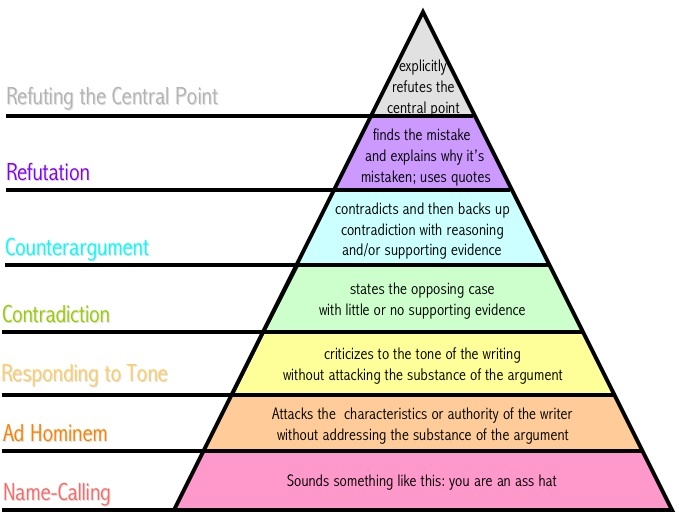 Since the disagreement on this site has not always been particularly productive, I’ve adopted a new policy in approving argumentative comments: I’m now only going to allow arguments that meet a particular threshold on Paul Graham’s Disagreement Heirarchy. Specifically, “Name Calling” and “Ad Hominem” arguments will be deleted. “Responding to Tone” might be deleted. “Contradiction” will probably just be ignored, while “Counterargument“, “Refutation” and “Refuting the Central Point“, will get a detailed response. Posts that contain both types of argument will probably have the lower arguments removed. Don’t like it? Tough. This is my blog, where I write my opinions. If you want to argue, then it should not be too much to ask that your arguments raise above a certain level. It will only help your case if you use the higher techniques. If you are worried about your arguments being deleted, then simply read Paul Graham’s Essay again, and apply it to your argument. 3. People who think they have “Morgellons” probably have a mixed variety of physical and/or mental illnesses.